Inspiration. I feverishly search for it at the beginning of every year. It could be a new book, a new pathway for a weekend hike, a new workout regimen, and yes, new recipes. One of my New Year’s resolutions was to cut down on carbs. I have been searching high and low for new low-carb recipes that will inspire me to keep focused and achieve my goals. I was eating an eggplant parmesan dinner the other night, of course, pushing the garlic bread basket away from me. Now, if you know me, you know this was a major feat. Bread. Tortillas. Pasta. Pan Dulce. Rice. Oh, how those carbs just wink at me, luring me into their web of weight gain and sugar rushes. But at that weak moment, I felt, yep, you got it, I felt inspired. I thought about how much I love Stacked Red Enchiladas, or Enchiladas Montadas, and how eggplant would be the perfect substitute for tortillas. 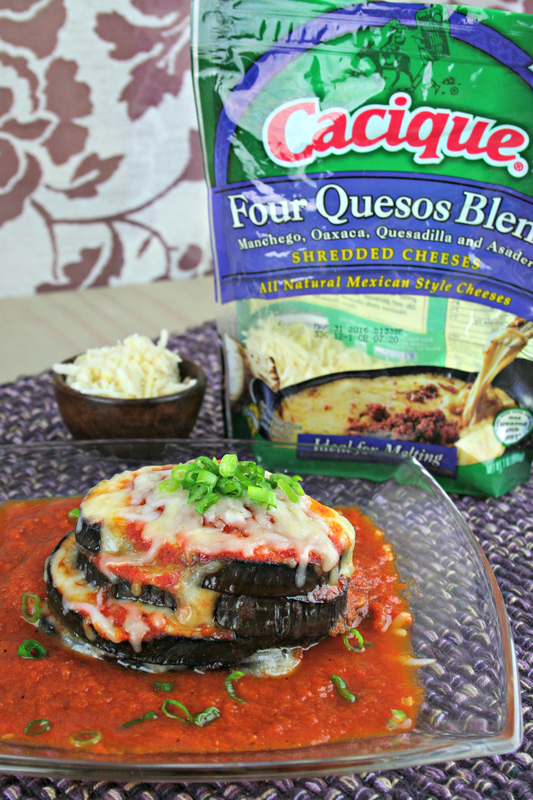 In my mind, I imagined a mountain of eggplant rounds being held together harmoniously with a beautiful blend of cheeses with a pool of red chile sauce underneath, like a volcanic island in the middle of the ocean oozing with cheese. And, the Cacique Four Quesos Blend worked perfectly for my dish. The Mexican-style blended cheeses include Manchego, Oaxaca, Quesadilla and Asadero. Together they deliver a smooth, buttery richness.